AINACS (All India Association of Catholic Schools) is a voluntary association of around 2000 Catholic Schools in India and is affiliated to the CBCI Office for Education and Culture. It is the only association of Catholic schools though it has a membership of only 2000 which is a small number considering the fact that the Catholic Church in India under the CBCI Office for Education and Culture has around 35,000 schools and colleges and around 20 thousand other educational institutions by way of Technical schools, Job Oriented Training Institutes, Special schools, Vocational Training Institutes, Boarding institutions, Skill Training Centres, non formal training centres, homes for street children apart from higher education institutions like Medical Colleges and Universities. AINACS as an association organizes annual training programmes for its members and holds a General Body Meeting which is attended by more than 500 members. Lately they have also begun to conduct some activities for students of the member schools. What is yet desirable would be greater involvement of the association and its members in the educational concerns of the Church in India, study and reflection on the Church documents issued from the Sacred Congregation for Education, greater involvement and an advocacy role as an association in the emerging challenges posed by the changing policies being introduced by the Government with damaging consequences. However the participation of the Chairman Bishop and the National Office Secretary – CBCI Office for Education and Culture at the Executive and General Body meetings of the AINACS, serves as a continuous reminder regarding the above mentioned roles that the association should also focus on. 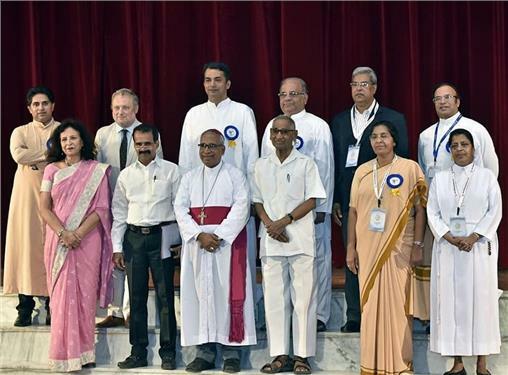 The Conference was inaugurated by Archbishop Thomas D’Souza- Chairman for the CBCI office for Education and Culture, Mr. Philippe Richard -Secretary General of the International Association for Catholic Schools (OIEC) and Mr. George Kurian-Vice Chairman, National Commission for Minorities and a galaxy of others who were also the resource persons at the Conference. They included Mr. Ashok Ganguli, Former Chairman of CBSE, Mr. Philip-a Columnist, Mr. Sitaram Yechury-Secretary General of the CPI-M and Ex Rajya Sabha M.P, and Mrs Jahanzeb Akhtar- Income Tax Commissioner and the hosts Mr. Jagdish Gandhi and others. Each of the resource persons spoke regarding their area of expertise to guide, advise and educate the 500+ educator participants of the conference. The Spiritual animation and celebration of the Holy Mass was done by a Bishop each day viz. Archbishop Thomas D’Souza of Calcutta, Archbishop Albert D’Souza of Agra and Bishop Gerald Mathias of Lucknow. Fr. Ashok M. Kumar- President, Bro. Thomas Thannickal and the Executive members of the AINACS meticulously saw to all the logistics in making the Conference a success. The speakers at the Conference highlighted the concerns of the Minority Communities in the country viz. the Muslims (20 crores), Christians (2.75 crores), Sikhs (2.1 Crores), Buddhists (85 lakhs), jains (45 lakhs), and Parsies (50 thousand). Although the Constitution of the Country gives maximum protection to the Minority communities, there are multiple violations experienced and promoted. Many speakers highlighted the many educational concerns and sought to empower the participants with the latest and the best in imparting education and delivering institutional administration effectively. The most liked session was that of Mr. Sitaram Yechury- Ex Rajya Sabha member and Secretary General of the CPI-M party who highlighted the basic issues faced not only by the Minority communities but the Country as a whole. He also focused on the educational concerns and the erosion of democratic and Constitutional values and the control and commercialisation and communalization of education and institutions. He also interacted with the participants answering several of their questions. The many emerging challenges in the area of education and the socio-political scenario in the country were highlighted and discussed during the days of the conference. The valedictory function was presided over by Mr. Philippe Richard who had come from the OIEC (International Office for Catholic Education) in Rome. He in his speech mentioned: ”The OIEC is an international Catholic organization, headquartered in Rome, which works closely with the Congregation for Catholic Education of the Vatican to promote catholic education in the world. The OIEC federates all the national bodies in charge of Catholic schools in each country, and is also a great part of the congregations involved in education, which represents a network of about 210,000 schools and more than 47 million students. Let me bring you the greetings of all other national organizations for Catholic education in America, Europe, MEA, Africa and Asia. OIEC has also the mission to represent all Catholics schools of the world before the UN and the UNESCO. We are very involved with the program Education 2030 and with the SDG and specially the SGD 4- quality of education. I thank specially Fr. Joseph Manipadam for his long and faithful participation in the life of OIEC, specially as a member of our Executive Council. He doesn’t hesitate to cross the world to participate at the different meetings. Due to him, India is well represented in OIEC.CBCI Office for Education and Culture Catholic Bishops' Conference of India is a constituent member of OIEC, and AINCAS is become a collaborating member.